In 2019 two men and two women will qualify for the extraordinary honor of representing their country and the sport of surfing on the world’s biggest sporting stage — the 2020 Olympic Games. These athletes will be the best of the best in the United States with strong coaches and an elite training regimen, but the job of preparing for peak performance on the Olympic stage is a new one. With the 2018 World Surf League season over, USA Surfing’s Medical Director Kevyn Dean began working with the top Olympic hopeful men and women surfers from the United States to start preparing for the 2020 Olympic Games. Dean is a board-certified orthopedic physical therapist who has worked with surfing greats like Brett Simpson, Nate Yeomans and the Gudauskas brothers, as well as athletes in other sports — including Olympic water polo gold medalist Kaleigh Gilchrist. World Surf League rankings at the conclusion of 2019 will dictate which American surfers will qualify for the 2020 Olympics (See qualification process.). Based on the 2018 rankings, the top Olympic hopefuls among U.S. women are №2-ranked Lakey Peterson, №3 Carissa Moore, №7 Caroline Marks, №8 Courtney Conlogue and №9 Malia Manuel. Among U.S. men, two-time defending WSL champion John John Florence, current №7 Connor Coffin, №11 Kolohe Andino, Sebastian Sietz, Griffin Colapinto and Ezekiel Lau are top Olympic prospects. Kelly Slater and newly WSL-qualified Seth Moniz also have to be considerations. Dean said the end of the WSL season is a good time for Olympic hopefuls to reflect on their performance, strengths and weaknesses, set new goals and gather baseline measurements. A combination of 3D analysis with forceplates measure and benchmark specific movement and balance for more targeted, effective training that leads to better performances and injury prevention. 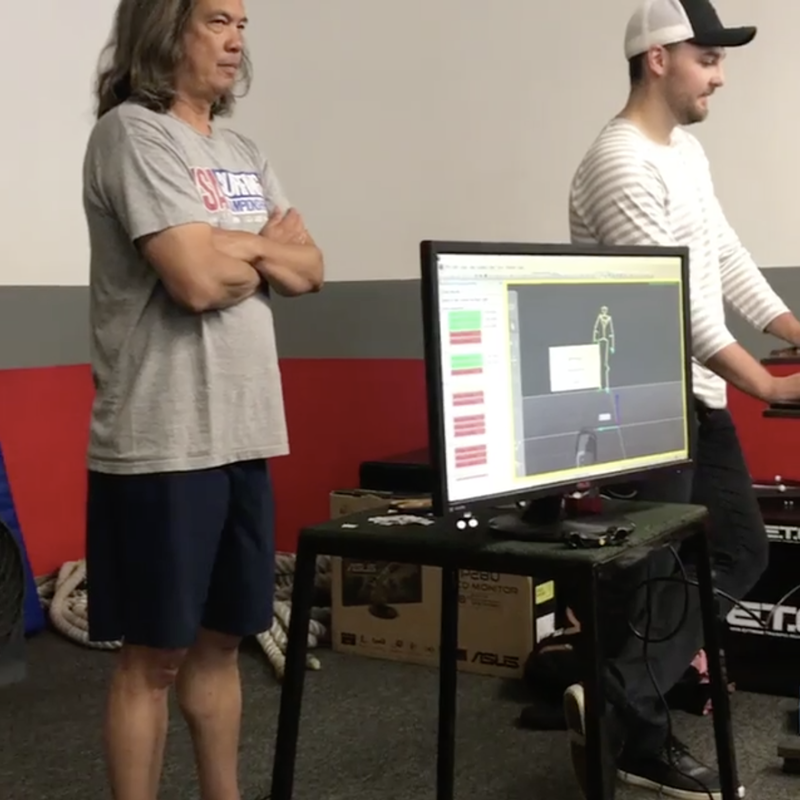 USA Surfing’s High Performance Training Center uses a combination of 3D video motion analysis and forceplates to measure and benchmark specific movement and balance. This information is critical in pinpointing weaknesses to condition and train for improvement in performance and injury prevention. Athletic and creative forces are taking the sport of surfing to new places and heights. Just when we think we are seeing the latest and greatest aerial maneuvers, mind-blowing barrel rides and rail work, someone tops it. Wave pools and athletes doing the hard work of training and practice will only drive more improvement and innovation at younger and younger ages. Just look at USA Surfing’s Junior World Championship medal-winning performances. Dean would like to see the sport of surfing get better at getting better — more science, more measurement, more intention. US Olympic Committee (USOC) resources and expertise are an obvious start. “Surfing is unique, but there is so much to learn from other sports,” Dean said. 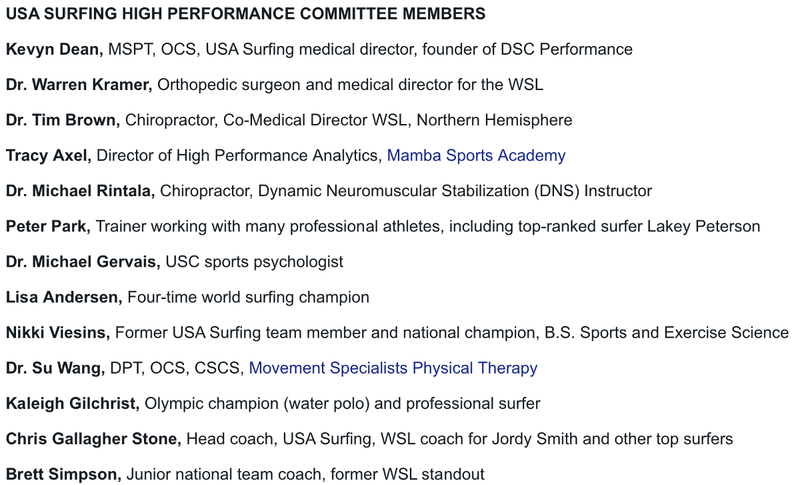 With the help of the USOC, USA Surfing assembled a high-performance committee of leading experts in surf athlete training and performance to support the U.S. Olympic Surfing Team. These specialists, who are top in their fields, will help create a performance pathway that supports winning medals and progressing the sport of surfing. Surfing is the only sport where the field of play — waves — constantly change. This makes proper body movement and technique incredibly important for improving performance and preventing career-ending injuries. 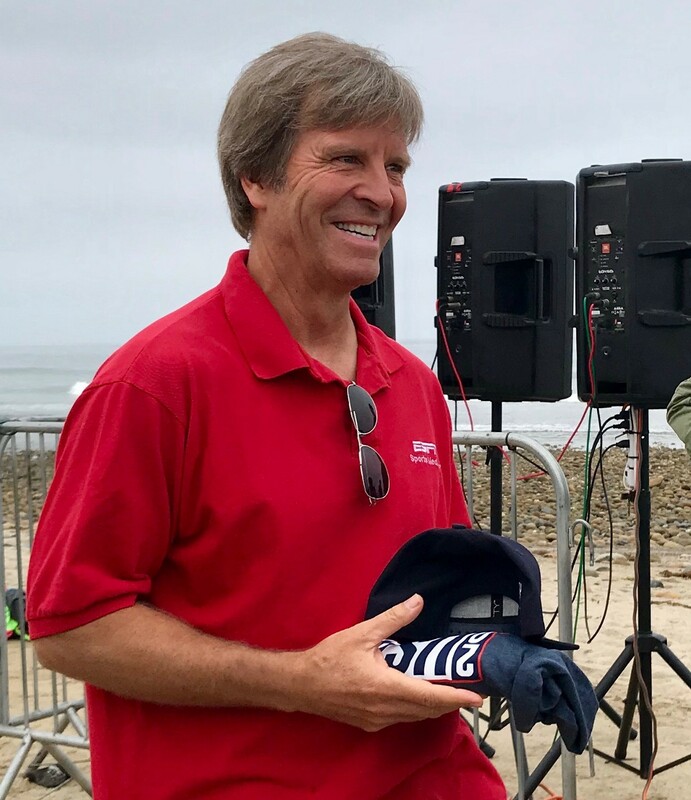 World Surf League medical director Warren Kramer is a member of USA Surfing’s High Performance Committee, which will help Team USA prepare for the 2020 Olympic Games. Dean said he’s happy to see more surfers training, but he and high-performance committee member and World Surf League medical director Warren Kramer are seeing more injuries in the fittest, and even youngest surfers. Surf athletes are getting stronger and faster, but when biomechanics are compromised this increased capacity leads to injury. “Being stronger doesn’t prevent you from incorrect movements. Being stronger just gives you more strength in compromised positions, which is a recipe for getting hurt,” Dean said. Dean says surfers need to focus more on understanding how they move in performing maneuvers and build the kind of strength that helps them move correctly. Surfers are doing bigger maneuvers than ever, but that’s not the main source of injury. Research and documentation of how injuries occur indicate it’s most often the smaller, cumulative motions that are hurting athletes. Dean’s approach recognizes that vulnerability to injury and less than optimal performance go hand in hand. An athlete who is not using his or her body correctly creates problems like not being able to hold their rail through big turns, release their fins or gain speed. For example, an athlete may not be able to compress in a turn because their hips are too tight or they have a knee injury. Maybe they can’t hold their rail, because a muscle isn’t firing at the right time. They can’t gain speed down the line, because they lack foot quickness. “When we know these biomechanical factors, a trainer has the opportunity to build the correct strength to maximize performance,” Dean said. 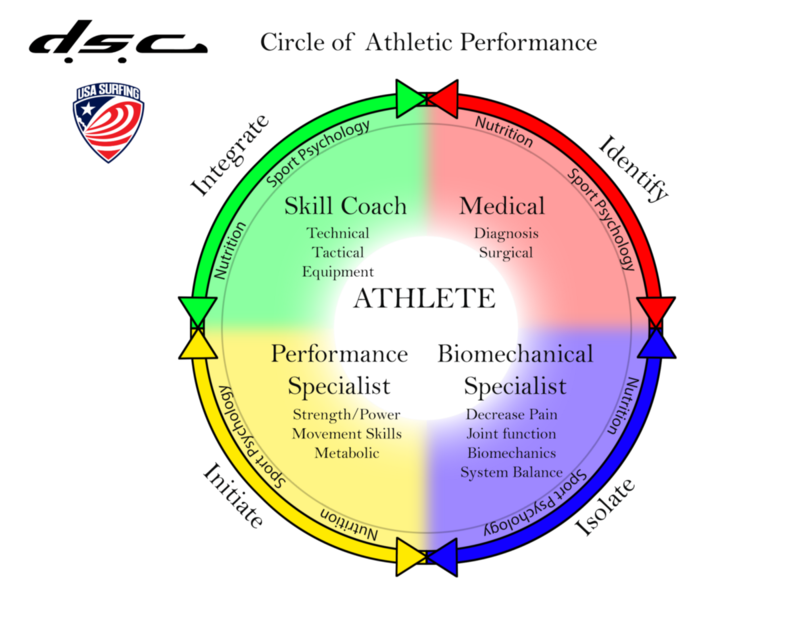 USA Surfing medical director Kevyn Dean uses a “performance circle” to illustrate all the mutually reinforcing factors that contribute to an athlete’s performance. Understanding each athlete’s biomechanics and technique and building a training program to maximize performance are fundamental elements of preparing for the Olympics. Dean uses a “Performance Circle” concept to visualize all the contributing factors to peak performance including nutrition, sports psychology, coaches, and physical therapy. The Performance Circle is the basis for all the expertise included in USA Surfing’s High Performance Committee and will be addressed in upcoming posts. This is the first in a series of posts that will chronicle surfing’s path leading up to the 2020 Olympic Games. 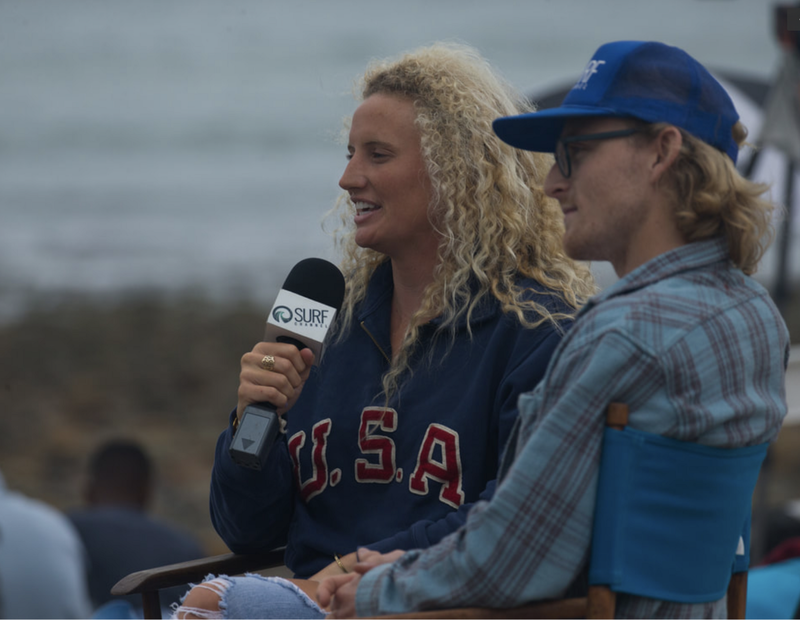 Olympic water polo gold medalist and professional surfer Kaleigh Gilchrist has experienced the Summer Olympics and has some advice for surfing’s Olympic hopefuls.